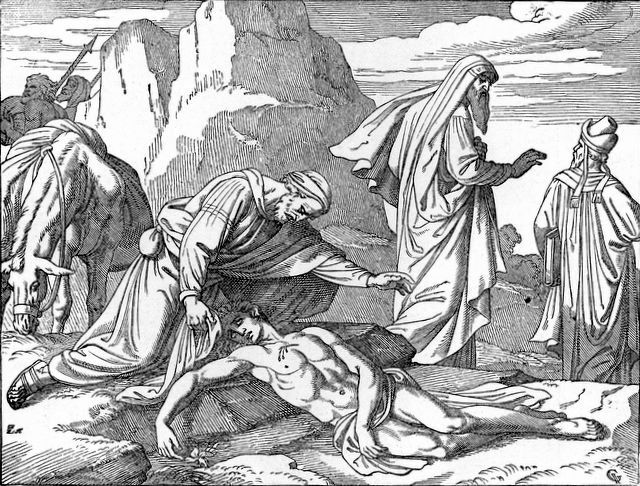 …He sees the wounded man, lets the man’s misfortune touch his heart, immediately dismounts, pours oil and wine into his wounds, bandages the wounds, and sets him on his own mount. He, however, goes on foot and brings him to an inn; there he places him in the care of the innkeeper and pays the innkeeper two silver coins to minister to the man until his return. This is a picture which accurately portrays Christ’s person and his love toward us; also, the fruits that inevitably issue forth in the lives of those who gladly hear his Word and gospel. The fact is that wherever his Word is welcomed and received in faith, it fashions people like the Samaritan here—gentle, compassionate, merciful people. They cannot bear to see anyone suffering and when this happens they tender their own resources and provide help howsoever they can. This is what Christ is picturing in this example. He is speaking here of needy, suffering people, like this wounded man, a person not at all unpleasant. To worthless, good-for-nothing, lazy beggars, who gain their livelihood by begging, and help no one, refuse to tend cattle or do any other menial kind of work, and yet want money in their pockets, we should not give a thing, but let them die of hunger. But where there are people truly in need, there it should behoove a Christian to do what the Samaritan does here. He thinks like this: This poor man is my neighbor; he is a human being and has body and soul just as I have. Yes, my God is also his God. He is, therefore, much closer to me than any beast of the field, simply because he is a human being; therefore, I cannot leave him lie and languish in want. So, come, my dear brother, let me help you; I will do all I can for you. And his actions demonstrate that he is true to his word, for he treats him as a father treats his child. Such individuals truly have the mind of God. But the other proud saints, who vaunt themselves over others, naturally have no compassion for the poor; they are harsh, loathsome people, for they think that our Lord God is pleased with their service. In fact, they think they don’t have to help or give aid to others, just like the priest. He was considered godly by reason of his office and birth. But what does our text say about him? When he saw the wounded man, he passed by on the other side!